Jim Bentley will have to piece together a side when Morecambe host League 1 pace-setters Walsall in the Johnstone’s Paint Trophy tonight, Tuesday. An already depleted squad was hit by further injuries in the 4-1 win over Notts County on Saturday. With club captain Peter Murphy already sidelined until November with a knee injury his deputy Shaun Beeley is now facing a spell out with hamstring injury. Laurence Wilson limped out of the warm-up ahead of the County game with a calf problem while Aaron Wildig went off having felt unwell in the run-up to the game. 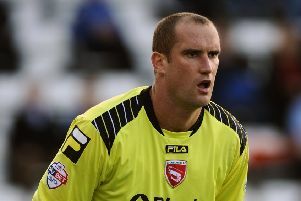 Bentley is also on the hunt for a back-up goalkeeper after Tony Thompson dislocated a finger in training. The game will however be the final one of Ryan Edwards and Kevin Ellison’s three-match bans. All that means Bentley knows his side face a daunting task against a Saddlers side who have won their last six in all competitions and reached last year’s final. The Shrimps boss said: “I mentioned last week that while we wanted to still be in the Capital One Cup that it was a blessing that we didn’t have a game because of injuries. “We’d have barely been able to field a team. If we had it would have been full of young, inexperienced players. “Now we’ve probably got it even worse heading into a tough game against Walsall. “We want to do well in every competition but it’s going to be very difficult because of the players we’ve got available. Walsall’s fine run has seen Dean Smith lead them to the third round of the Capital One Cup where they’ll host Premier League champions Chelsea. Bentley said: “They’ve got Chelsea in the cup so if they’re going to take this competition lightly we’ll have to wait and see. “They’re going well in the league as well and will be hoping to continue their good start to the season.